You were excited when you learned that the xmtr for Radio Mediterranee Internationale was located in Nador, "Spanish Morocco," right? Imagine the thrill if you had been around in the 30's to hear one of these stations from the days of the "real" Spanish Morocco. 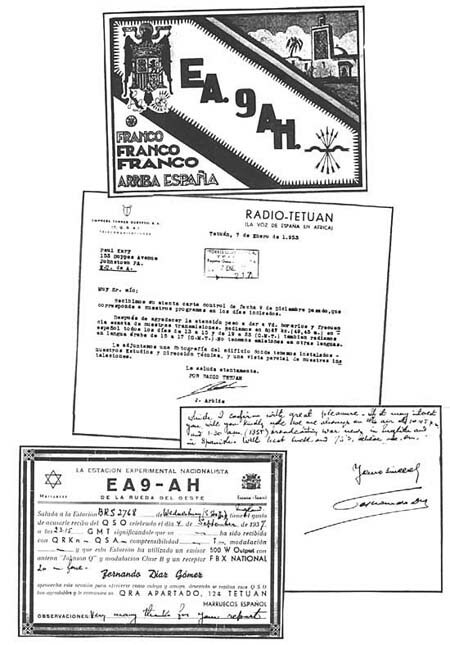 EA9AH was a combination amateur and shortwave broadcast setup, Franco's key propaganda station in Morocco during the Spanish Civil War. Broadcasting from Tetuan, it was often heard in the United States around 1600-1800 EST on 7,010 and 14,030 kHz., and other nearby channels. The bottom QSL is from 1937, when the war was still in progress. The top one is from May 1939, by which time Franco had won the war and was in full control. Radio Tetuan was active in the mid-50's, eventually becoming Radio Dersa, the last shortwave outlet in Tetuan. It disappeared from the scene in 1960.